20 x 3 levels of mostly sight ‘type’ words or high use words. 1 set of 38 Days of the Week and Months of the Year words. Children match the correct and incorrect words and place on the yes or no pile. Can also play as a matching game – match the correct with the incorrect. It is best for children to avoid seeing the wrong spelling as this confuses them. 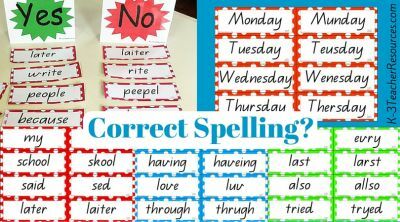 If their brain only sees the correct spelling , at least m. A better way to do this is to use cards to play pairs or memory and the children really enjoy this for reading and spelling To many children words are black squiggles and so seeing words with wrong spelling is extremely difficult for them and does not help their learning. Thank you for the great teaching resources! Fabulous resources! Thank you. They save so much time for teachers. Any chance for some higher levels?